View right outside my tent!!! 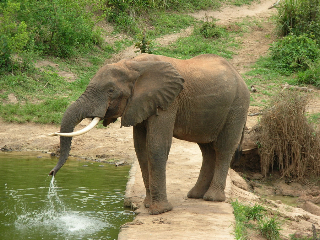 Welcome to the Mwaluganje Elephant Sanctuary in Kenya!!! November, 2007: Kristal traveled to the Mwaluganje Elephant Sanctuary in Kenya to observe elephants in the wild and to meet the wonderful villagers who, out of a desire to live in harmony with elephants, turned their farm land into a sanctuary to preserve elephants. She also visited the Sheldrick Elephant Orphanage in Nairobi. Please enjoy the YouTube below that features eles from both of these places. If video does not come up, click here to go to YouTube.